Getting here by public transportation: From Union Square area, take either the cable car or a historic street car on the F Line along Market Street. Yes, it is commercial, and yes, locals stay away. But wandering around here is lots of fun, and the locals are missing out on something because they have trouble seeing beyond the parking restrictions. Feasting on fresh Dungeness crab or on clam chowder in a Boudin sourdough bowl are definitely San Francisco treats. The Cannery at Del Monte Square Bounded by Beach St./Leavenworth St./Hyde St./Jefferson St. This charming red brick shopping complex, constructed in 1907, was once the world’s largest fruit and vegetable cannery. It now holds many unique shops, and free entertainment by street performers is scheduled daily under century-old olive trees in an inviting courtyard. Cost Plus World Market 2552 Taylor St./North Point St. The original store in a chain that now numbers 278, this gigantic importer has long been a favorite shopping stop for visitors. Back in the ‘60s, it was where everyone stocked up on “hippie” supplies: batik bedspreads, incense, candles. Current imports from around the world include inexpensive jewelry, kitchenware, and baskets. Keane Eyes Gallery 3040 Larkin St./Beach St. Located across from Ghirardelli Square, this expansive gallery is devoted to the work of artist Margaret Keane. Well-known for her paintings of children and animals with big round eyes, she can make even a bull dog look cute. Prices range from $35 for a poster to $850 for a limited-edition print to original paintings beginning at $12,000 and rising to more than $185,000. Back in the Beat era, her paintings hung at Enrico Banducci’s famous hungry I nightclub on Jackson Street and you could pick a painting up then for as little as $50. "Big Eyes," directed by Tim Burton--who is a longtime collector of Keane paintings--and starring Amy Adams and Terence Stamp, tells more of the story. 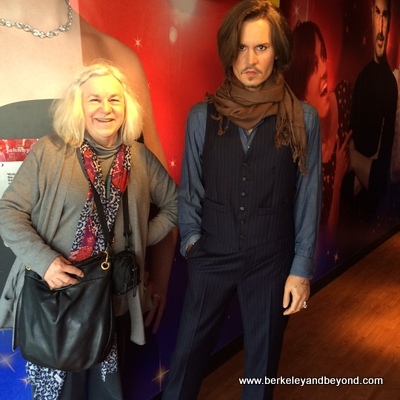 Madame Tussauds San Francisco 145 Jefferson St./Taylor St. You can hang out front with Johnnie Depp or the Royal Family for free, but this will likely entice you to pay the entry so you can do more. I was surprised to be told that it was ok to touch and get up close and personal with the iconic celebrity figures inside. Though I had my companion take pictures of me with almost every figure, I did find it creepy to actually touch them. And the only way I could tell for sure they weren’t real was to check that they didn’t blink. One factoid is that hair is inserted by hand—strand by strand—and it can take up to five weeks just for one figure. Celebs are broken into categories, so Janis is in the Spirit of San Francisco section (as are Jerry Garcia and Carlos Santana), Elvis is in the music section, Marilyn is in the film section, and George is in the A-List Party section (you can cozy up to him on a couch). A few tips: make sure your camera battery is charged; and dress nicely so that your friends might actually believe you were hanging with the stars. Many discounted coupons available. The San Francisco Dungeon Adjacent. Recommended for age 10+. The first such attraction in North America, this subterranean walking tour takes you through San Francisco’s sordid past. Actors bring stories to life with the help of atmospheric sets, special effects, and a boat “ride.” The journey keeps you moving, and though surprises evoke a few screams and squeals, they also elicits smiles, and you might even become part of the show. Musée Mécanique Pier 45, Taylor St./The Embarcadero. Alioto’s #8 Fisherman’s Wharf, at bottom of Taylor St./Jefferson St. Historical photos of the Wharf line the stairway up to the restaurant, where the view is about as San Francisco as you can get--the fishing boats, the bay, The Bridge--and plenty of oversize booths and window-front tables provide comfortable seating. Fresh seafood is always a good choice, but the many Sicilian regional specialties are also worth trying. Spicy deviled crab served in a scallop shell, pan-fried sole picatta, and potato gnocchi with creamy tomato sauce are particularly tasty. Portions are bountiful, and both European and New World wines are served Old World-style in volume-marked glasses. The charming little Calamari Room off the main dining room can be reserved for parties of six to ten people. Downstairs, Alioto’s Waterside Cafe provides a scenic view of the Golden Gate Bridge over docked fishing boats. It serves up sandwiches, seafood salads, housemade clam chowder, delicious fried prawns, and fresh crab in season. A sidewalk crab stand operates out front. Boudin at Fisherman’s Wharf 160 Jefferson St./Taylor St., Fisherman’s Wharf. After watching the bakers through a sidewalk window, where they sometimes respond to questions via a two-way speaker, visitors can choose between informal dining downstairs in the Boudin Cafe--both inside and outside on a heated deck—and finer dining upstairs in Bistro Boudin (it is pronounced either “boo-deen” or “bow-deen”)--with a dead-on view of Alcatraz. Among the best items are an ever-popular clam chowder in a sourdough bowl, meaty crab cakes, and pizza. Upstairs, the Bakery Museum Tour is an homage to sourdough bread-making with some interesting city history mixed in (did you know Boudin is the oldest continuously run business in San Francisco?). After all these years, they are still using the same starter and the same ingredients—flour, water, and salt. The busy first-floor bakery can be observed below from a glass-walled catwalk, and a tasting room visit completes the tour. The well-stocked gift shop is worth a browse. Take home the perfect souvenir--a loaf of bread in the shape of a darling turtle or alligator. The Buena Vista Cafe 2765 Hyde St./Beach St. In 1952 the owner of this legendary bar challenged local travel writer Stanton Delaplane to help him re-create the Irish coffee served at Shannon Airport in Ireland. The biggest problem was getting the cream to float. Once mastered, the result is history, and this cozy bar now dispenses more Irish whiskey than any other spot in the country. A decaf version is available. (The official recipe according to its inventor, the late Joe Sheridan, is: Cream as rich as an Irish brogue; coffee as strong as a friendly hand; sugar sweet as the tongue of a rogue; and whiskey smooth as the wit of the land. See how the Irish make Irish coffee today.) It is de rigueur to stop at this cozy spot and find out what all the fuss is about. Delicious casual meals have been served since the 1890s and currently include hamburgers and sandwiches as well as hot entrees with fresh vegetables. A window seat provides views of the action across the street at the cable car turnaround and of the bay and Golden Gate Bridge. Pat’s Café 2330 Taylor St./Chestnut St. (on the Mason-Taylor cable car line). This modest café features comfortable banquettes along its long, narrow, papaya-colored walls. More color is provided by a sprinkling of Fiesta Ware on the tables, and owner Pat usually greets diners in a bright red fleece vest. American comfort food and an expansive breakfast menu are the claim to fame. Favorites include banana granola pancakes, eggs Benedict, and French toast. And everyone seems to like it here: On a recent visit, a customer at one table wore a Yahoo! hat while a customer at the next table donned a Google visor. Scoma's Restaurant Pier 47, on Al Scoma Way at Jones St./Jefferson St. Hidden away from the touristy bustle and featuring a prime waterfront location, this old timer is reached via a back alley leading out over the area’s actual wharfs. Built from a modest coffee shop and using the owner’s family recipes, it boasts a pleasant old San Francisco ambiance, big windows with views of weathered boardwalks and fishing boats, and a professional waitstaff. And since it is the only restaurant in San Francisco with a commercial license to buy right off the boats, it's hard to beat the fresh seafood selection. Meals begin with exceptional sourdough bread made by Boudin especially for the restaurant (they use 175 loaves on an average day). When at capacity, two separate kitchens keep the wait short. Menu items are organic when possible, and an active effort is made to recycle. The menu includes everyone’s favorites, many of which are house specialties--Lazy Man’s cioppino, fried calamari, clam chowder, crab cakes. The chef also prepares perfect scallops and a delicious crab risotto studded with fresh peas, and house-aged Angus beef is available.